So The Chosen One is now the Walsall manager Dean Smith as Brentford supporters await agog for confirmation that he will hopefully become the new Head Coach at the club. 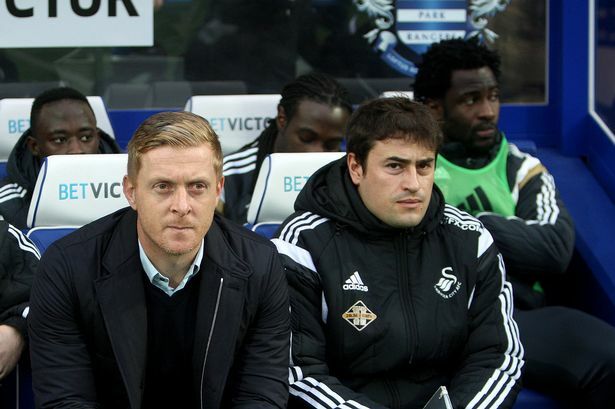 Whilst Pep Clotet was apparently the first choice for the job, that deal could not be consummated for a variety of reasons perhaps not unconnected with the current uncertainty at Swansea as well as the total cost of the package required to bring him to Griffin Park. It is important to say up front that second choice does not mean second best as I understand that the club would be more than delighted if either candidate decided to take up the challenge. So whilst we wait for the situation to be resolved and I am sure that the cameras tonight at Bolton will be panning the stands in the Macron Stadium in the hope of seeing Smith lurking in the background or skulking in the shadows, I thought that it might be helpful if we examined his career in greater detail and looked at his background and achievements. Smith is still relatively young in managerial terms at forty-four years of age and had a long and distinguished playing career as a no-nonsense centre half who played well over five hundred Football League games for the likes of Walsall, Hereford, Leyton Orient and Sheffield Wednesday. He will fit in perfectly with Brentford as he played in four unsuccessful playoff campaigns for Walsall, Hereford and Leyton Orient and fully understands and has experienced the heartache of falling short at the final hurdle! His best friend would not have described him a cultured defender but he read the game well, was tough and effective and he almost broke the heart of every Brentford fan back in 2004 when he equalised for Sheffield Wednesday in Martin Allen’s Great Escape season seemingly long after James Alexander Gordon had begun to recite the final scores after the referee, George Cain, had lost all sense of time and played on until the home team scored. After retirement, Smith became Youth Team Coach and Assistant Manager at Leyton Orient and remained there until 2009 when he was named as Head of Youth at Walsall before taking over as manager in January 2011, making him the fourth longest serving manager in the game, behind only Arsène Wenger, Paul Tisdale and our old friend Karl Robinson with an incredible tenure, given the vulnerability of any manager’s position, of four years and three hundred and twenty-nine days. I am sure that all Brentford fans, desperate for a speedy resolution to the current situation, sincerely hope that he does not make it much beyond that impressive figure! He is a well qualified and respected coach who possesses his UEFA Pro License and he encourages his teams to play positive, passing and attacking football and to play the ball to feet, as we have learned to our cost in previous meetings between the two clubs. His time at Walsall has been highly successful given their relative lack of resources, and he took them to Wembley for the first time in their history last season in the final of the Football League Trophy and he has established them in the top half of the table with the promise of a promotion challenge this season as they hover around the top six in League One. He has an encyclopaedic knowledge of the lower divisions and youth football at all levels and has brought through or purchased many young players of exceptional ability such as Will Grigg, Florent Cuvelier, Sam Manton, Romaine Sawyers, Tom Bradshaw and Rico Henry. Brentford have never found Walsall a pushover in recent years and I well remember a hard-fought draw at The Bescot Stadium in January 2014 when The Saddlers ended our run of eight consecutive victories and could easily have won the game late on. Mark Warburton’s verdict on the home team that day: It was a tough game and Walsall worked hard and moved the ball well, perfectly sums up the approach of a typical Dean Smith team. From what I can tell Dean Smith fits the bill as far as Brentford is concerned. He has nearly five years’ worth of managerial experience and has gained a deserved reputation as a excellent coach who more than makes the most of what he is given. He develops and encourages young talent and allows them to flourish within a positive environment and I am told that he is good at man-management. What Martin went through made me realise how important it is to appreciate that there is an outside world, away from football. The support network of your family, friends and staff is integral. I have always seen myself as a positive person and you come to realise that you are dealing with the natural sensitivities of human beings. That’s why I don’t go into the dressing room after games. It is too emotional a time. I would rather wait, and speak to the players rationally on Monday morning. Thanks to Mike Calvin and Living On The Volcano for that quote which emphasises just how thoughtful and well-rounded a character is Dean Smith. It is quite obvious that his team respects and plays for him and he has also done a good job of managing upwards to a tough Chairman in Jeff Bonser who does not attend home matches because of his unpopularity with the Walsall supporters. His philosophy is to play good football and, regardless of the results, I think that’s how we play. We’ve stuck to the philosophy and we’re going to continue to stick to it, because it’s bringing us some success. I can totally see why Brentford want Smith and let us just hope that the feeling is reciprocated. Bonser will probably be a hard nut to crack in terms of compensation and he refused his manager permission to talk to Rotherham when they came calling a few months ago. Hopefully Smith will want to take up the challenge at Griffin Park and make it obvious to his Chairman that this time he wishes to leave. Smith was fairly disparaging towards Brentford at the time when we signed his star striker Will Grigg, whom he felt should have joined a bigger club, rather than another League One outfit, however I will take that as a simple case of sour grapes as all is fair in love and war – and football too! I am sure that nothing is finalised at the present time and that this, just like the Clotet deal, could still go either way. There are no guarantees as there are so many intangibles and potential obstacles that can arise as well as a plethora of different parties involved in any deal including agents and family members. We also have to keep within our budget and ensure that the entire recruitment package is realistic and affordable. There will also be the need to decide if he brings any of his staff with him. Bonser might have something to say about that as might Matthew Benham given the continued presence of Paul Williams who would surely expect and fully deserve a coaching role in any new set up. Lee Carsley’s role will also need to be clarified if it is not already decided. As you can see, there is much to ponder on and a lot that needs to be settled before we can breathe easily. Walsall have a crucial match against local rivals Shrewsbury Town on Tuesday night and I am certain that all parties would like to know where they stand before then so I expect a speedy decision one way or the other within the next twenty-four hours. Let’s all keep our fingers crossed! This has certainly been a horrendously difficult and unsettling week for everyone involved with Brentford FC, players, management, staff and supporters alike. Head Coach Marinus Dijkhuizen and his assistant, Roy Hendriksen were both sacked on Monday and replaced until the end of the season by Lee Carsley, whose job as Development Squad Coach went to Bees stalwart and legend, Kevin O’Connor. On the field, Saturday’s narrow and frankly undeserved home defeat by Sheffield Wednesday was followed by a dreadful performance on Tuesday when a totally listless, rudderless and dispirited Brentford team limped to a two-nil defeat by Birmingham City which was immediately followed by Lee Carsley’s naive and unexpected, if totally honest post-match admission that he had no real wish or desire to become a football manager and would therefore be likely to leave the club once his spell in charge was completed. Comments that understandably, have not been well received by Bees supporters. I can’t speak for anybody else, but my head is certainly spinning and reeling trying to process and assimilate so much traumatic and negative activity in such a short period of time and I have already written at length about my own analysis and reading of the situation. Well things certainly look gloomy with a newly appointed head coach who does not think he will be there next season and a team with no apparent motivation, something I find hard to understand. When we were fighting against re-election in 1974 everyone wanted to do their best and the players who were pulling out of tackles or not giving their all were simply replaced by other pros or even by young players like me who were maybe not good enough but who ran theirs sock off for the club. Yes I know football has changed a lot and yes this is not the Fourth Division we are talking about, but for God’s sake just give me a team of eleven players whatever their age who give their all for the club and I cannot believe that there are not a couple of players in the Development Squad who cannot step up to the plate and help the first team. They might not be quite up to the standard required but I am sure they would give their total commitment. As for the coaching side, maybe the owner will admit that things aren’t working quite as anticipated and put his new-fangled approach on ice and appoint a real manager for the time being. Come on you Bees, at least show us that you’ve got guts and will give your all. Whatever the outcome we are behind you. I think we have to admit to a lack of quality and physicality too. The team on show on Tuesday was a League One outfit at best. We seem to have signed continental footballers who lack touch and technique – the two things that you would expect them to have whilst they adapt to the more physical side of the English game. I’m so down on our club right now. I actually feel very emotional about it. Five years of intelligent endeavour to build something special is being wrecked before our eyes – with both things initiated by the same person. What Matthew Benham does next will determine his legacy and our future – I doubt he’ll read my words, but just in case, please Matthew come out and speak to us, and let’s try to get everyone back on board before it’s too late. Last night we were a League One quality side with three passengers: Vibe, Djuricin and Kerschbaumer. We were playing another League One side who were incredibly well organised and did all of the right things at the right time. We are ill-equipped to fight a relegation battle, but we are in one. I excused Lee Carsley last night because he probably didn’t know he definitely had the gig until last Sunday. I was saying that the jury was out and maybe he was a wonder coach. He would be able to turn things around despite not having any track record at this level. Now I learn that he expects to go at the end of the season, which sounds to me like he had his arm twisted to take the job. To say that is not encouraging is an understatement. Perhaps the owner should get in touch with Ian Holloway or Neil Warnock to hold Lee’s hand? And get in some Championship calibre players on loan as well to replace our foreign imports who will take too long to become acclimatised, as well as some of our League One standard players. Another excellent article and the reason why there’s no point in me writing a blog myself – after all, you say very eloquently what I think most of us are thinking! 1. Letting Warburton go or engineering a situation where he felt he had to go was a MASSIVE mistake by the club. As much as we owe him for getting us where we are today, the blame lies squarely at the owner’s door. 2. The mathematical model should have been put on hold for as long as Warbs was with us. For goodness’ sake, we finished FIFTH IN THE CHAMPIONSHIP last season! After years of languishing in lower league obscurity! Surely Benham should have parked his new approach, kept our best manager ever and held onto Warburton for another season at least? 3. Dijkhuizen was a nice guy, but to coin a phrase, “nice guys finish last” (or nineteenth as things currently stand). He was the WRONG APPOINTMENT and hopelessly out of his depth. I sit next to a Derby fan at work and we talk about the Championship all the time. As he puts it, it is a RELENTLESS league! Not amazingly high quality, but you need to be on your A game every single Tuesday and Saturday (with the occasional Friday and Monday thrown in for good measure). Dijkhuizen simply did not have the experience, wherewithal, tactical nous or, I’m afraid, connection with the players to be successful. Yes, eight games (actually nine, counting the battering by Oxford) is not nearly long enough to prove yourself – but anyone who watched the Reading match or the first half versus Wednesday will know how awful we were, and I’m afraid that when it comes to preparation, team selection and tactics, the manager ultimately has to carry the can. 4. To coin another phrase, where Bournemouth went for evolution, we went for revolution. Too much, too soon. And one area where the club really failed was in anticipating just how many of our key players from last season would want to leave after Warburton departed. Yes, Moses may well have left anyway, but I honestly believe tha had Warburton remained, the likes of Dallas and Gray would have felt more inclined to stay too (and obviously Douglas would not have been forced out the door). 5. The question has already been posed, but why on earth has Ryan Woods been stuck on the bench? Yes, he made a mistake against Leeds, but when he came on against Wednesday he looked absolutely sensational – but he was only given FIVE MINUTES!!! To me, he is the future and we should be building a team around him. Dijkhuizen should have shown positive intent against Wednesday, started with Woods and Canos and gone for the win from minute one. If I was Benham and had spent the best part of a million pounds on League One’s most exciting young player, I wouldn’t have been happy that my head coach wasn’t giving him a game. I am sad for Dijkhuizen and I am angry at the club we all love so much, but I am also excited and pleased that we now have another chance to hopefully start the season afresh from this point on. Like most Bees fans, when I go to a game I want to see passion, commitment, heart and some semblance of a plan based on intelligent attacking football that primarily involves keeping the ball on the deck. In the games I’ve seen against Ipswich, Reading and SHeffield Wednesday this has simply not been the case (sadly the only home game I missed was the only game we won). I appreciate that we have shown flashes of good play here and there, but here and there is not enough – especially not at this level. For that reason Marinus had to go and I am looking forward to an English (Irish) manager who will hopefully take the passion we all feel for the club, channel that to the players and begin to turn things around on the pitch. Even with all the injuries, we still have the makings of a good team. Let’s now have the confidence to show it. Another great, if deeply depressing, post, Greville. Also very insightful comments by Mike and Rebel Bee. I wasn’t at the game and it shows how not actually witnessing it first hand can give you such a false impression. At nil-nil I thought it was looking okay, with possibly our first clean sheet of the season coming. But reading about what actually happened has only served to darken my mood even further. What kind of response is that? If he was so reluctant to take the role, then why on earth did he accept when it was offered? What kind of example does that set for the players – to say nothing of the fans? Let’s make no mistake, we are now in a relegation battle. We can probably expect to get battered on Saturday and should maybe write that one off right now, but come the next home game against Rotherham we need to be totally focused on the task in hand, because only a win will do. The way I feel at the moment is confused, nervous and incredibly upset. Did Crown / Benham / Devlin / Ankersen / Giles have any idea of the way Carsley felt? You would surely have to say no, otherwise why give him the role in the first place? Did they see him as being so honest with the press? Again, you would surely have to say no. It makes us look amateur – to say nothing of the way our Championship rivals will surely seize on it to gain the initiative when they play us. Will Carsley still be there in a month’s time? I honestly don’t think so. Forget all this “leaving at the end of the season / I don’t want to be a manager” nonsense. We need a passionate figurehead in charge who can galvanise the players and inspire the fans. Sorry Mr. Benham, but that person is not Lee Carsley. What’s Neil Warnock up to these days? I think the decision for this sacking was constructed far earlier than this week. How many of us would succeed in a new company where your equipment is broken (pitch), your best staff dispersed to your competitors and then replaced with untried temps who are learning on the job and then, to compound it all your ace sales team all end up on long term sick leave? The manager’s fault? Hardly. I just wish Crown and Ankersen stood up and said “you know, we got this gamble wrong.” I would have way more faith and respect for that, as this is the path we have publically stated we want to follow (no harm in that) – who of us has never made a management mistake? But it was their mistake not the manager’s. Too many foreign league so-called bargains, not enough Championship tried and tested players – a lesson learned concerning the right mix. As for Marinus, coming from Excelsior to the Championship was in my view a step too far, or maybe too early but he was also not given the right tools in place to succeed by Brentford. Culture differences, game pace and media scrutiny make the Championship brutal and possesion is pointless if you do nothing with it. Last weekend I listened to some clever nitwit on Sky annouce that the team with the highest level of possesion in the entire football league was Brentford – he then followed by adding “and lets look at their league position.” I did use a few unrepeatable words at the telly, which the wife overheard. The media wants us to fail at this soooooo badly, make no mistake about that. I do still think we are in Warburton withdrawal mode (me included). I need to get over that. Be brave – stand up and say it – we gambled on our manager and came up short and we sold off too much talent before being certain of its replacement. Don’t be so hell bent that every purchase or decision has to be totally radical because that is what the media expect of us now. I think the Carsley decision makes much more sense in terms of his pedigree, international experience and internal club knowledge. It really is a massive chance for Mr. Carsley, who I think stands to receive more support than his predecessor did, which seems unfair on reflection. I suppose what I really wish is that we don’t try to play bargain hunting with our managers like we do with our squad acquisitions and the Marinus appointment had that feel to it. In the meantime I hope that Carsley can ramp up the tempo and the spirit for tonight’s game – I get the feeling Birmingham might smell blood and I hope we can get after them from the get go. How badly does our team need a man manager right now? We need a determined leader/manager to drag their sorry backsides out of the sea of self pity and get stuck in and raise the game tempo. I travelled four hours last night to see Brentford play at such a pedestrian pace that you would have thought we were the away team trying to kill a game off. Honestly, what team in this division cannot defend when provided with over five minutes to set up their defence for a corner? What I can’t understand is it was blindingly obvious last year that the Championship respects and fears pace in equal measure. The money we received for Odubajo and Gray confirms that. So when did we decide that seventy-five percent possession and zero penetration played at snail’s pace will return better results? So the thought occurred to me, the statistical models indentified them as good enough – but do they play like they believe they are? The brand of football being played right now is choking the flair and inventiveness out of the players and it is as much crushing as boring to watch, as you rightly pointed out. Interestingly, by comparison did you know….. I read that one of the first things that Warburton did when he arrived at Ibrox was post a big sign up in the dressing room….do you know what he had written on that sign? SEND THEM HOME HAPPY in big capital letters above the dressing room door. Hmmm, can it really be that simple? Some fans are saying don’t criticise or Matthew Benham may pull the plug, if he is truly “one of our own” this won’t happen, he’ll work his socks off to fix this and regain all of our trust and goodwill. If he does withdraw support then you’d have to ask what sort of a club would we have become anyway, and was the price of having such a benefactor worth paying? He must have a hard and at times thankless task, but some communication and engagement now is not so much to ask for, surely? It has been really tough going so far, the thrill of my next Brentford fix has been erased overnight. I am sad to admit that I will not be at Derby and need the international break to get over the last week. I’ll never give up on my team but it kills me to see others thinking of doing so. Matthew Benhams judgement must surely come under scrutiny. He had months to scour Europe for a replacement for Warburton and came up with a guy he has got rid of after eight games and then gives the job to someone who was under his nose all the time. I don’t know how much say Dijkhuizen had in transfers but surely the mass signings of unproven foreign players with no experience of English Championship level by Benham, Giles and Ankersen was a mistake. Coupled with the departures of several key players and our horrendous injury run it is no surprise that we have struggled. After the debacle of the Reading home game, performances since have undoubtedly improved and despite rumours of training ground unrest I have seen nothing to suggest that the players haven’t been giving it their all for club and manager on the pitch. The jury remains firmly out on the effect of the stats based system in my opinion. We remain totally ineffective and impotent on free kicks and corners despite expensively assembled specialist coaches employed in this field. One also wonders how stats from the second division of a European League correlate with the level we are now playing at. As always we will rally round and get behind the new manager who may well turn out to be an inspired choice, he will hopefully be helped by returning players soon. Interesting, passionate and well thought through comments that make depressing reading at what is a pretty depressing time for us all. Today’s news that Brentford Head Coach Marinus Dijkhuizen and his assistant, Roy Hendriksen have both left Griffin Park frankly comes as little surprise. The official statements from the club and Chairman Cliff Crown are brief, carefully worded and they take pains not to use the S word. Parted company is the bland and anodyne expression used to explain their departure but let’s make no bones about it – the two of them have been sacked. Dijkhuizen lasted a mere one hundred and twenty days in his post. Appointed on the first of June he departed on the twenty-eighth of September having presided over a mere nine competitive matches. Whilst he was officially titled Head Coach, he was team manager in everything bar name and should therefore be compared against previous occupants of that position. Let’s get the history out of the way first. In modern times the previous shortest managerial tenure at the club was Eddie May’s who lasted nineteen games in his three months in charge followed by Leroy Rosenior and Terry Butcher who was in charge for twenty-three games and Scott Fitzgerald who managed one more match. Eddie May potentially presents an interesting parallel for those of us who are conspiracy theorists. An unknown appointed out of left field from Dundalk with indecent haste by David Webb in August 1997 at a time when the club was in total disarray with a squad that had been decimated by the sale of players and the arrival of unknown journeymen replacements, he quite understandably struggled to get results and when the repeated promises of funds to improve the team failed to materialise he was sacked along with his assistant Clive Walker in November 1997, after just four league wins had left the club embroiled in a relegation battle which they ultimately lost on the last day of a quite dreadful season. May was perceived as Webb’s dupe, the fall guy for the previous manager who had taken over as Chief Executive with the prime intention of ensuring that funds were brought in so that the club was debt free before it was sold to Ron Noades the following year. Are there any similarities when we come to consider the reasons and rationale for the change in management that took place today? Whilst there have been some rumblings and murmurings from supporters spoiled by the constant stream of success over the past three seasons and used to the wonderful attacking flair of Mark Warburton’s playoff team last season, the overwhelming majority of Brentford supporters are extremely patient and fair minded and were prepared to give Marinus more time, particularly given the almost insuperable problems he faced that were totally out of his control. That being said there were growing concerns about his commitment to an impotent and restrictive 4-3-3 formation that patently wasn’t working given the limited resources he had and required constant changes on the hoof when we were chasing games that were already slipping away from us. Lasse Vibe, a proven international striker was hamstrung from being forced to play out wide on the right wing where he has been an isolated figure, rather than more centrally where he and Marco Djuricin looked a highly potent threat when they were finally allowed to play closer together. Konstantin Kerschbaumer was an ever present in the team despite seemingly overwhelming evidence that he was unable to cope with the physicality of The Championship and the presence of expensive new signing Ryan Woods on the bench who has been clamouring for a start. I have spoken to many of the key protagonists over the past few weeks and I have found absolutely no evidence that Marinus was in any way shape or form, overruled, instructed, hamstrung, restricted or second guessed in any of his key responsibilities in terms of picking the team, training and preparing them for action and most crucially in terms of game management, tactics and substitutions. He was given an entirely free hand and the freedom to act as he best saw fit. So any comparisons to Eddie May are totally inaccurate and invidious. Marinus was no puppet and was allowed to be his own man. He had bought into the Brentford project and was happy with the new management structure. He was consulted on all player moves both in and out and whilst he would have liked some additional loan signings to cover for the current injury crisis, Marinus was content with the quality and calibre of the new signings. So why then did he leave if he was not being made the scapegoat for a series of poor results that were to a large degree out of his control? Now this is where I have to resort to speculation and informed guesswork. Perhaps the alarm bells were beginning to ring with the powers that be because of some of the onfield tactical and selection problems that I have previously mentioned earlier in this article as well as exploring in depth yesterday. He also suffered in comparison with his predecessor. Mark Warburton was certainly a hard act to follow and his successor needed to get off to a flying start, something that was denied Marinus. Warburton was also a workaholic control freak, in the nicest sense of the words. He arrived early at the training ground and left extremely late. Training routines were meticulously planned and organised well in advance and the players knew exactly where they stood and how they were going to spend their days. It would appear that Marinus and Roy Hendriksen did not run such a tight ship in terms of either time keeping and preparation and a far more laissez faire atmosphere prevailed. This apparently did not go down well with either players or management. I believe that today’s action has been taken by Matthew Benham on the recommendation of the Co-Directors of Football in order to nip matters in the bud before they can be allowed to get out of hand and beyond control. It cannot be denied that this is an enormous blow to the credibility of the new regime at the club and I am sure that the media will not be slow to point fingers and make fun at our expense. Such are the vicissitudes of life and we will just have to cope with this opprobrium as best we can. Brentford pride themselves on doing things differently to other clubs, thinking out of the box and acting far smarter than their rivals. An enormous amount of due diligence was done before Marinus was hired and he interviewed exceptionally well and seemed to tick all the boxes. However the fact remains that actions speak louder than words and apparently he has not convinced the powers that be since he arrived and drastic action has been taken sooner rather than later to avert the slump before too much damage is done. It could reasonably be argued that this is an extremely brave move rather than a panicked knee jerk reaction and this could even be a turning point for us in what is developing into a tough season and one where consolidation is perhaps the best we can hope for rather than pushing on from last season’s massive and incredible achievements. As they say – one step backwards – two steps forward! Lee Carsley is an excellent choice to take over the mantle as Head Coach. Supported by Paul Williams he is a known entity who has already gained the unconditional respect of the entire squad. He is an experienced and proven international footballer who can put his caps on the table and he has previous managerial experience at Coventry City. Most importantly he has a deep working knowledge of The Championship and he will be keen to put one over one of his old clubs, Birmingham City, at Griffin Park tomorrow night. So on the surface this has not been a good day for the club, but when you drill down deeper and think matters through, then perhaps it has been a brave and correct decision to relieve Marinus and Roy of their jobs. All will surely be revealed and become apparent over the coming weeks and months.